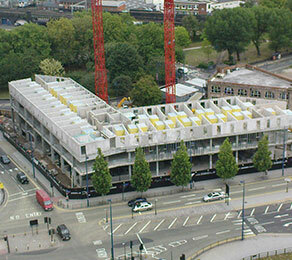 CCL designed and post-tensioned (PT) the suspended floor slabs on levels two and three, using its XF system. The design featured a 300/220 mm post-tensioned flat-slab for level two and a 600/520 mm PT transfer slab for level three, which had to support three to six levels of precast structure. The company proposed a concrete-mix design for the transfer slab, in order to reduce the risk of cracking associated with such large, deep concrete pours. Downstand beams were situated at cantilever locations in the transfer slab to control deflections. Design of both levels incorporated an 80 mm central recess strip so precast bathroom pods could be dropped into the slabs, reducing the amount of screed required after installation. One of the challenges faced by CCL included the removal of a supporting column from beneath the transfer slab, to suit architectural requirements. The resultant 15m span meant local support was insufficient for the precast structure above it. CCL resolved this by designing a 15 m PT transfer beam with a surrounding grillage of beams to span the void. The benefits of this PT design included a reduction in the amount of reinforcement required, compared to the original proposal. Removing the majority of downstand beams produced longer spans and allowed formwork to be placed more quickly, thereby accelerating program cycles.